The primary roles of packaging are to contain, protect and preserve a product as well as aiding its handling and presentation. It must carry out these functions under reasonably foreseeable conditions of manufacture, distribution, warehousing, retailing and use. Incorrect packaging leads to problems with goods inwards, receipts, picking, incorrect deliveries, queries, returns, unwanted inventory and credits. As well as the direct effect on margins, these problems impact on efficiency and customer service. The Telecoms Traders Packaging and Labelling Standard has been designed to cover the proper identification of packaging including pallets, transit, outer, inner and retail packs, for product packaging transported within the Products supply chain. Compliance to the standard will improve speed and operational efficiency and lower the cost of service for trading partners in the industry. Pallets Product description and quantity on pallet labels must be readable from a distance of 3 metres in well-lit or day light conditions. Pallet labels should show product code, description and barcode including unit pack quantity and quantity in agreed format. 2) Transit/Outer Packs All product information describing the contents together with barcode to be shown on two adjacent and vertical sides, so that when the product is stored in its normal position it can easily be read, whether it be horizontally or vertically stacked. The outer label should be readable from a distance of 2 metres. (b) Clear, Easily Legible Product Description. (c) Supplier Reference/Product Code in bold print. Where possible an area should be provided on all packs for use to site a delivery label. Delivery labels should be added at the point of despatch of the goods. Consideration should be given to the weight of filled boxes in accordance with Health and Safety guidelines and individual organisations own risk assessment procedures. This includes making the transit pack easy to grasp and handle, and where possible specifying actual weights. Both the transit and inner packs to be fit for the purpose intended, and should be of sufficiently high quality to withstand travel between manufacturer, wholesaler, retailer and consumer, so that they remain in good condition throughout the journey along the distribution chain. When the packing list is enclosed inside a shipping container, this must be clearly indicated on the outside of the container. The packing list should ideally be attached to the outside of the carton in a self-adhesive clear or documents enclosed envelope. On a pallet shipment, the product identification on each carton and the location of the packing list should be clearly visible, and if placed inside a carton, must be readily accessible. If goods are of a peculiar shape they should be boxed in stackable outers. Use strong tape designed for shipping. Make sure the joins have enough tape to hold them securely closed, and run tape 3 times in both directions across the box and joints. Use adequate cushioning material, and completely fill the box with packaging material, so there is no movement or space inside the box. If your sending large fragile items such as electronic equipment or machinery, the product should be fully suspended inside the box, using moulded polystyrene that’s specifically moulded to the product you’re shipping. Don’t encase the outer packaging with paper or plastic or use string. All ESD sensitive devices shall be handled with care. Customers shall take ESD safe handling precautions when unpacking and packaging ESD-sensitive devices. Be contained in a plastic or metallized static shielding bag o Not be packaged with regular shipping Styrofoam, bubble wrap (or similar) packing materials. 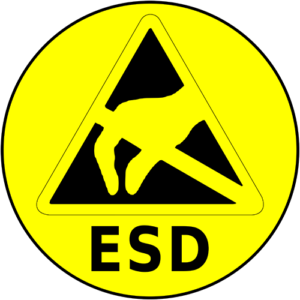 All packaging materials shall be ESD safe.